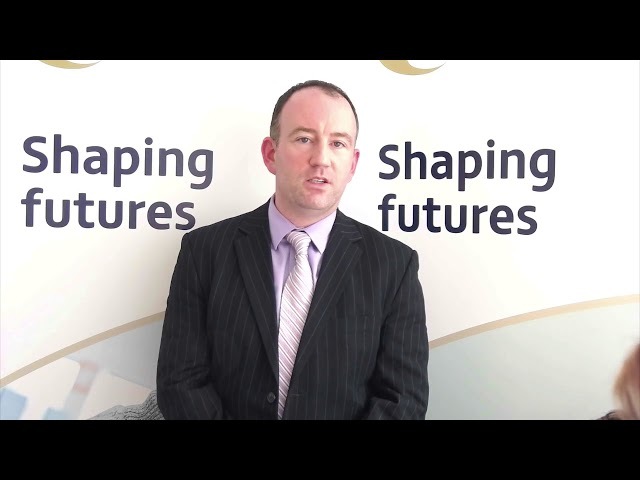 A legacy of investment in the education of the next generation of clinicians should be the most important ethos of our clinical education delivery as we continue into the 21st Century. We currently recruit extremely intelligent individuals into the medical profession and it is vital that we nurture those individuals to release their full potentials. Don’t forget we all continue to learn every day and such educational activities should sharpen our own minds as well. An educational program should provide mentorship and support, create an effective training environment while facilitating educational acquisition outside of the comfort zone as well. 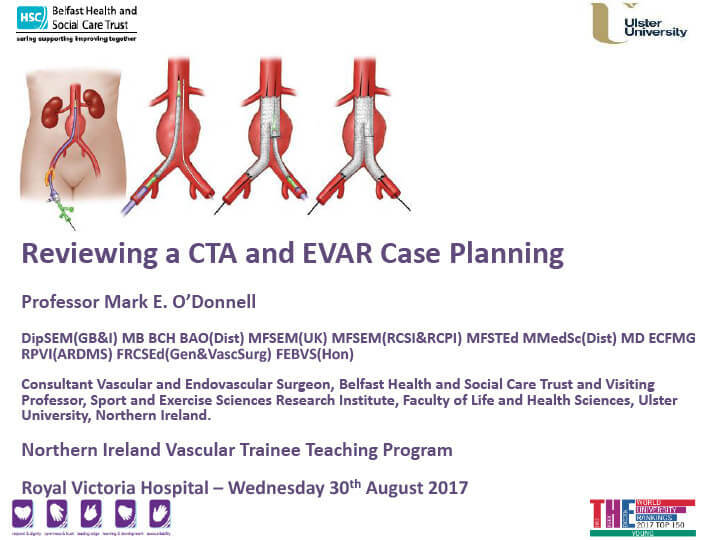 Trainees in Vascular Surgery will undergo core training (CT1-2) followed by a period of 6 indicative years of specialty training (ST3- ST8). 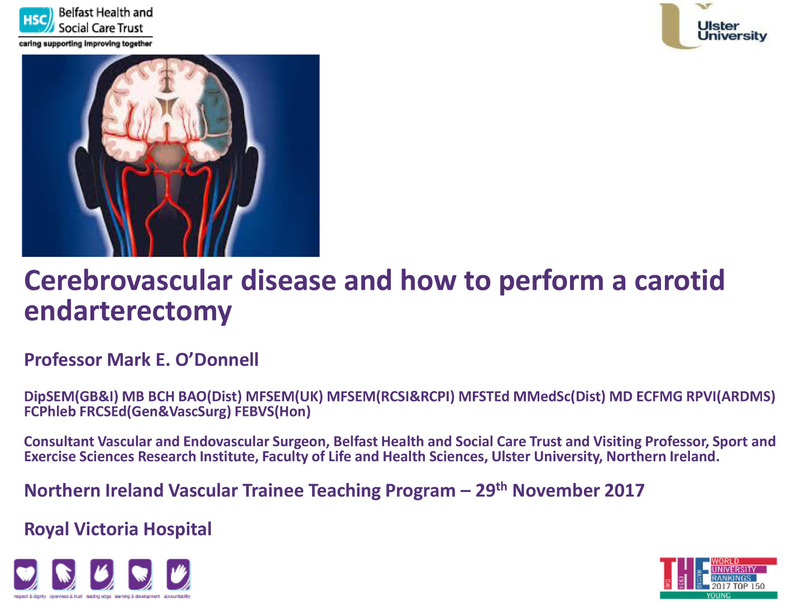 The purpose of this curriculum is to train vascular surgeons up to CCT level who will be able to work independently and to the standard of a consultant or equivalent. 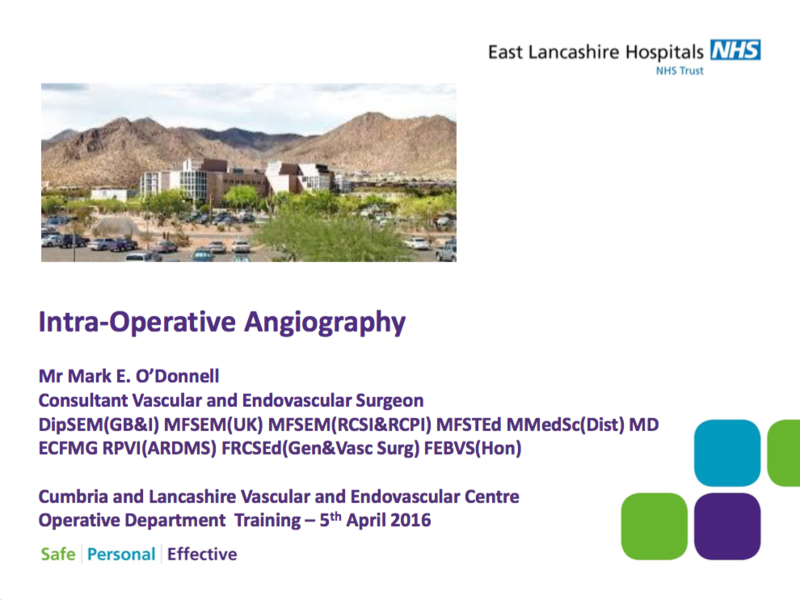 As such, most of their skills will relate to the management of 'everyday' vascular elective and emergency surgery and this forms the basis of the curriculum, with the competences, both non-operative and operative being completed by the final year of training. 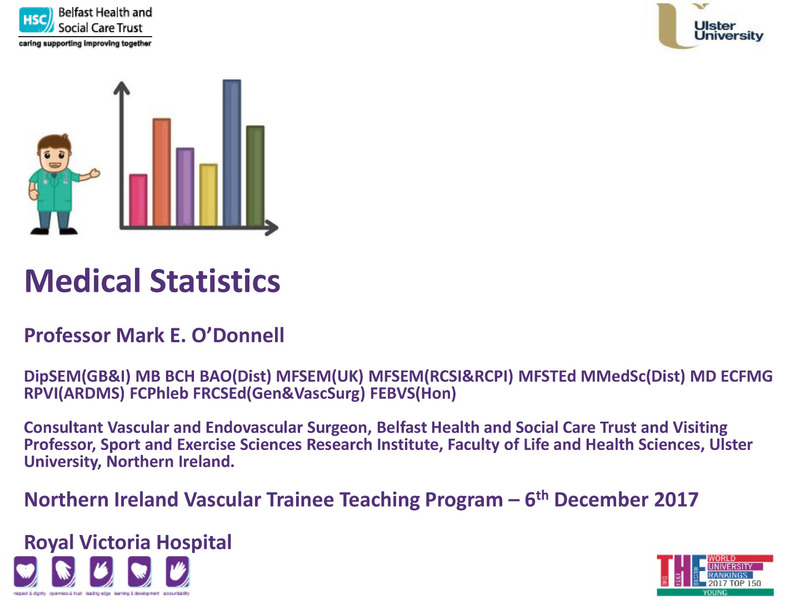 The current vascular curriculum is extremely encompassing and will warrant a significant amount of hard work throughout the trainee’s period of training – “Start Early and Work Hard”. 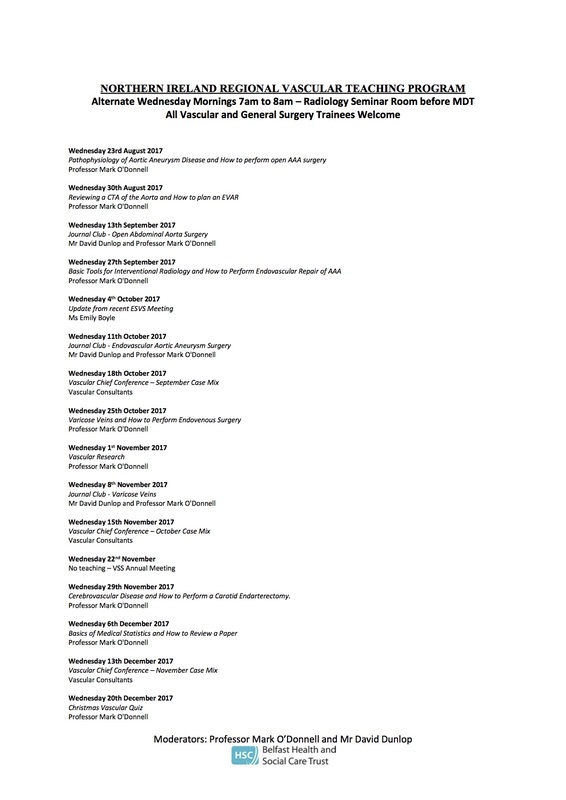 New **Vascular Chief Conference** where Senior Vascular Trainees present their case-logs for the preceding month to all Consultant Vascular Surgeons from the Northern Ireland Regional Vascular Centre with exploration of selected cases. 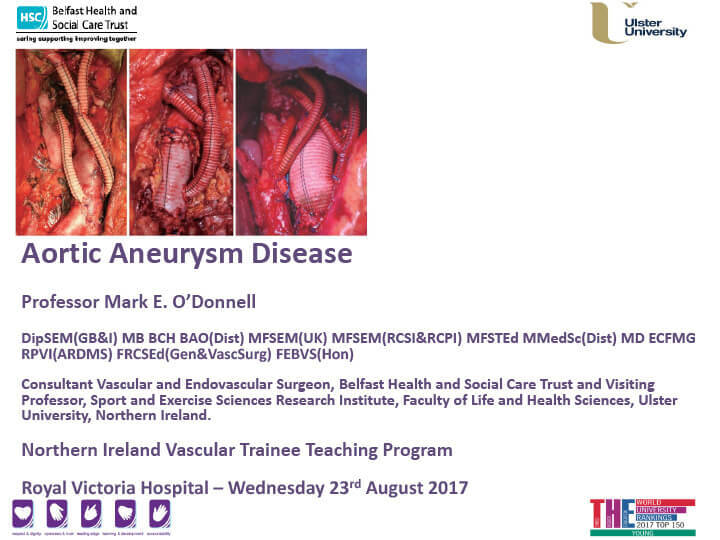 Please find enclosed recent presentations from the Northern Ireland Higher Vascular Teaching Program. 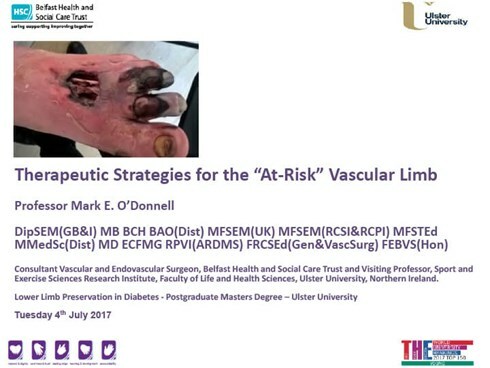 A new experience for me to complete a recorded virtual lecture - Therapeutic Strategies for the “At-Risk” Vascular Limb. Thanks to Gerard and Aine at Ulster University for looking after me in the Recording Studio. 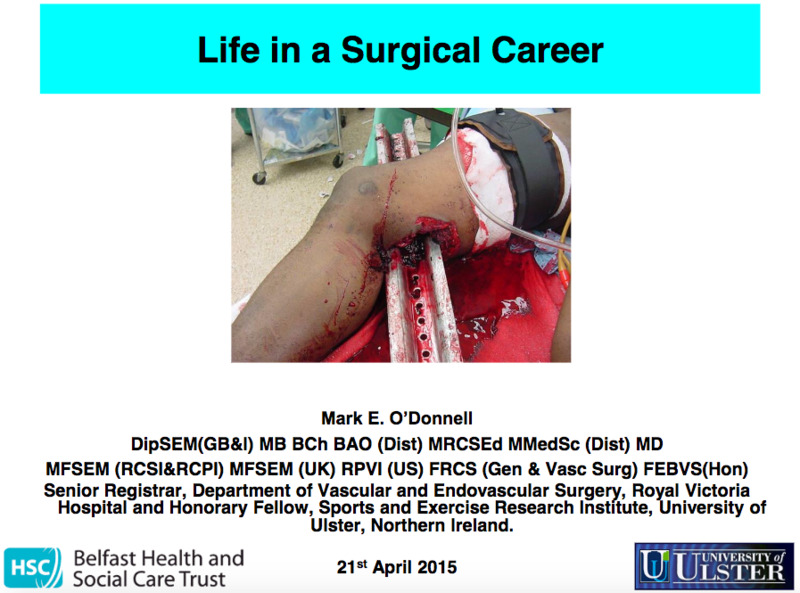 The recorded lecture is available on the Videos section of this web page – Parts 1 – 10. 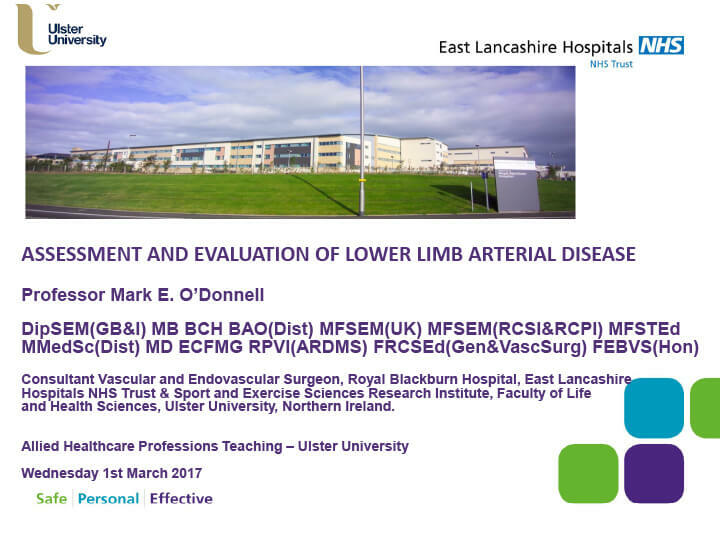 Thanks to Janette Connolly, Jacqui Crawford and Jill Cundell for the invitation to present a number of lectures to Podiatry and Allied Healthcare Undergraduate Students on a range of vascular pathologies. 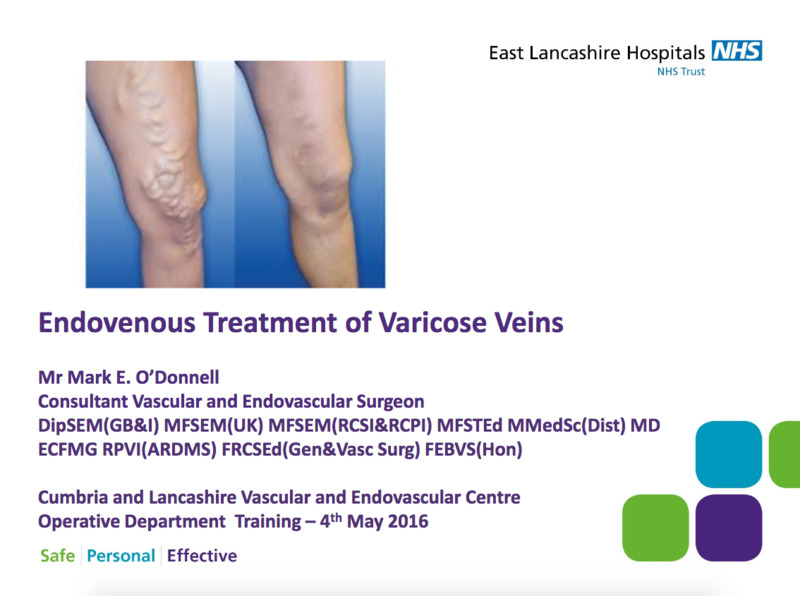 A fantastic teaching day organised by Mr Vittorio Perricone at the Royal Blackburn Hospital for the North West of England Higher Vascular Trainees’ Masters Course. 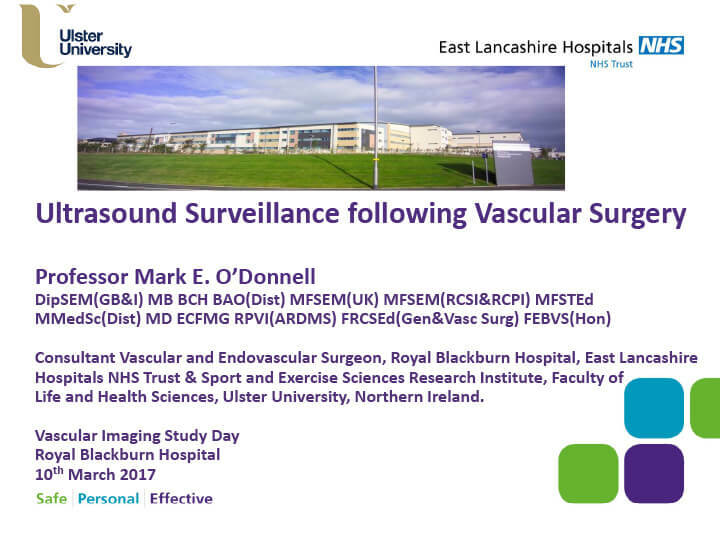 Was delighted to research and present on Ultrasound Surveillance following Vascular Surgery. 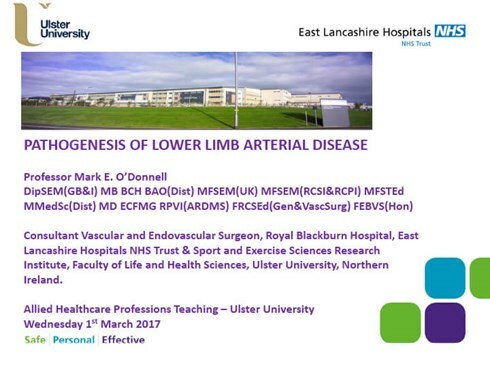 Thank you to Georgina Leaver and Mr Haytham Al-Khaffaf for their invite to discuss “A Surgeon’s Perspective of Major Limb Amputation”. This annual event is attended by all members of the vascular multi-disciplinary team and an informal atmosphere encouraged lots of questions. 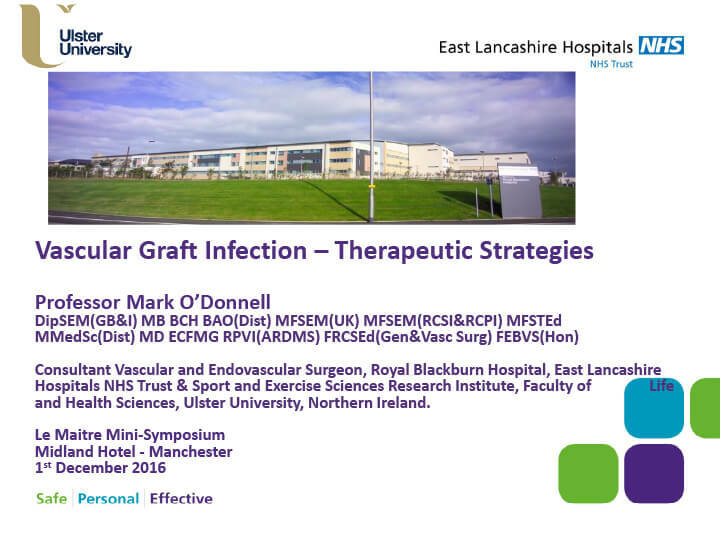 Chairing a mini-symposium sponsored by Le Maitre reviewing vascular graft infection and potential therapeutic strategies. This symposium proposed the collation of data regarding the implantation of the Bioprosthetic Omniflow graft with consideration of a retrospective database prior to consideration of prospective data collection. Thanks to Helen, Ged and David. Presenting “Outcomes and Prognosis of Mesenteric Ischaemia” at the Annual North West of England Vascular Society Annual Meeting. 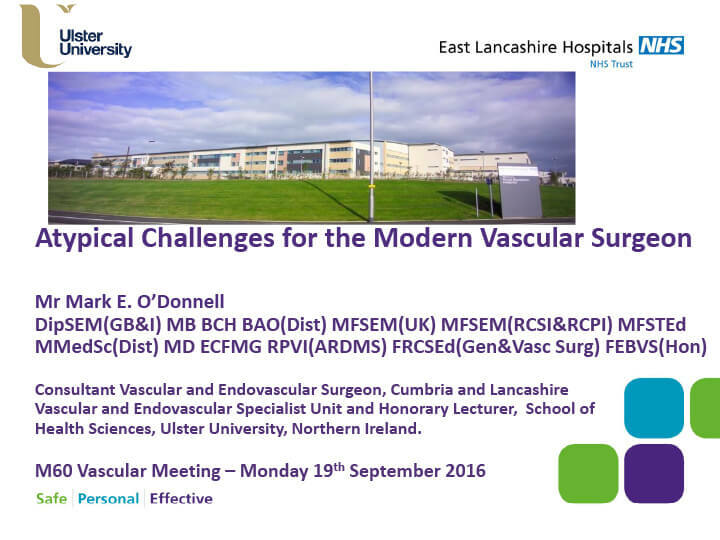 I was privileged to chair September’s M60 meeting which discusses “Atypical Challenges for the Modern Vascular Surgeon” and included a number of presentations from the Royal Blackburn Hospital Vascular Team. Thanks to Mr Adam Haque and Professor Mo Baguneid for their invite to present. 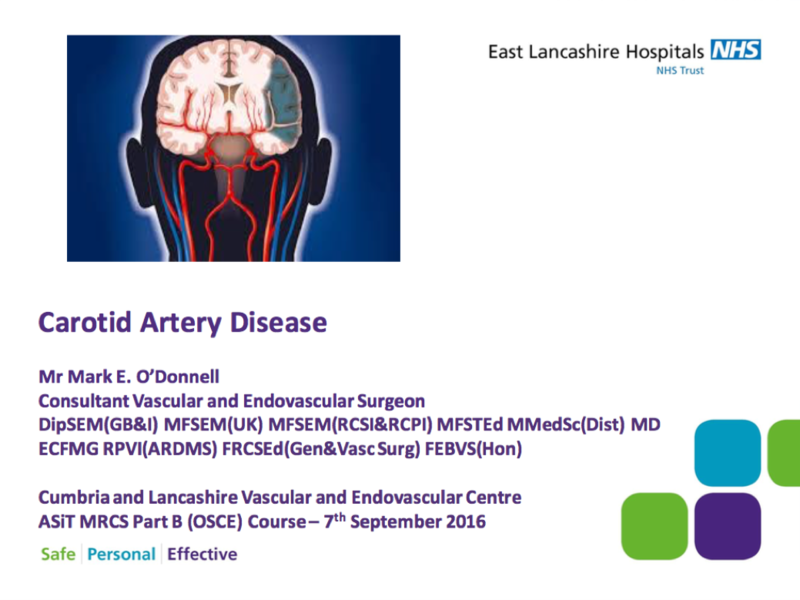 This course was delivered at a very high level combined with anatomical teaching at Manchester University. 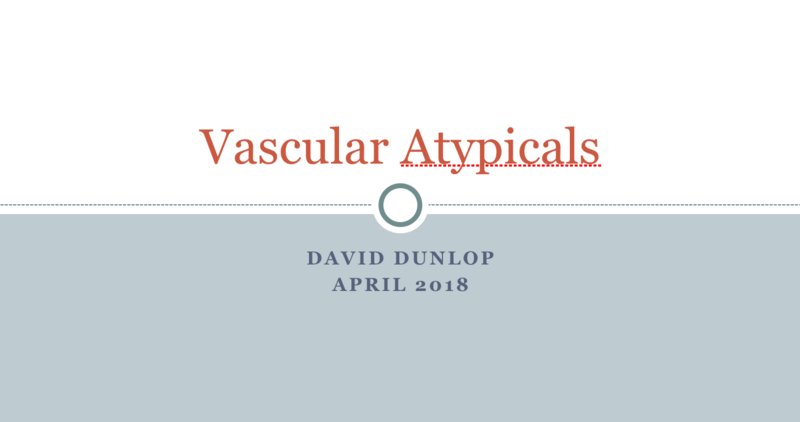 My educational remit was to cover the major vascular systems encompassing disease definition and pathogenesis, clinical presentation, investigation and subsequent therapeutic strategies combined with an update of the current clinical evidence. Thanks to Mr David Chang for the invite to present my experience of “A United States Vascular Surgery Fellowship”. 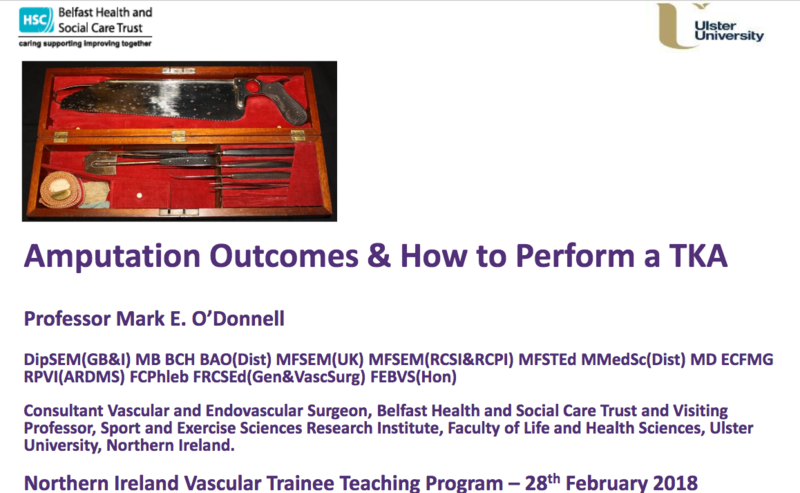 Thanks to Mr Robin Baker for the invite to return to the Medical Biology Centre at Queen’s University Belfast to present at the QUB Final Year Medical School Careers Evening. Mr Sam DeBono, one of our Senior Clinical Fellows from the Royal Blackburn Hospital, presented his poster at the 2017 CACVS annual meeting in Paris - The successful treatment of a proximal type 1 endoleak using Aptus Endoanchors. Assessment of Carotid Plaque Ultrasonic Morphology for Predicting Ischaemic Stroke Risk in Symptomatic Carotid Artery Disease. Ravi R.Goel, Meenakshi Goel, Mark E. O’Donnell, Haytham Al-Khaffaf. 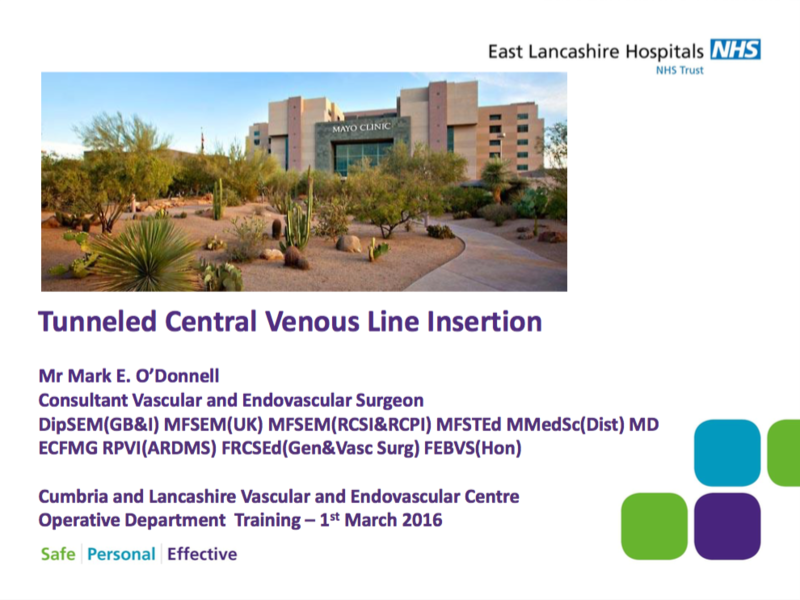 Evaluating the potential for a new specialist Central Vascular Access Service: Are we using too many Hickman Lines? Alexander Seager, Jane Dean, Clare-Marie Owen, Robert A. Salaman, Mark E. O’Donnell. Rescue Management of Vascular Graft Infections using Sartorius Muscle Flaps. Louise Cousins, Adam Haque, Asad Rahi, Haytham Al-Khaffaf, Simon Hardy, Robert Salaman, Mark E. O’Donnell. 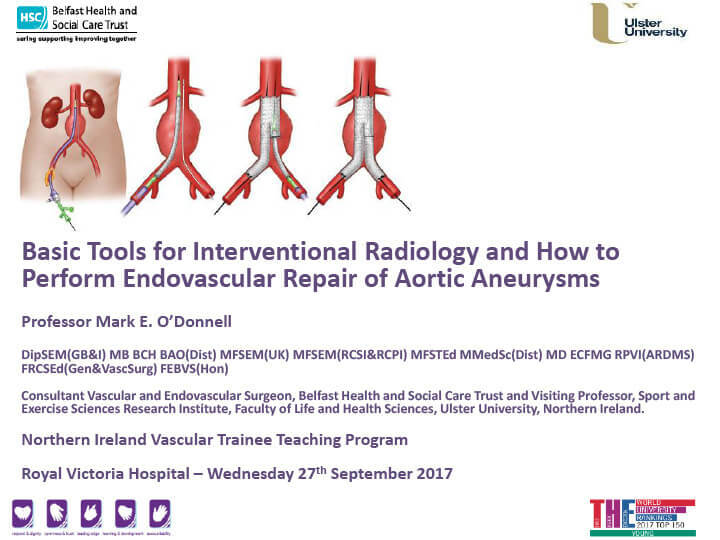 The Successful Treatment of a Proximal Type I Endoleak using the Aptus HeliFX EndoAnchor System – A Useful adjunct in EVAR Re-intervention. Louise Cousins, Johnathan Porter, Adam Haque, Sharath Hosmane, Neil Wilde, Peter Woodhead, Haytham Al-Khaffaf, Robert Salaman, Mark E. O’Donnell. 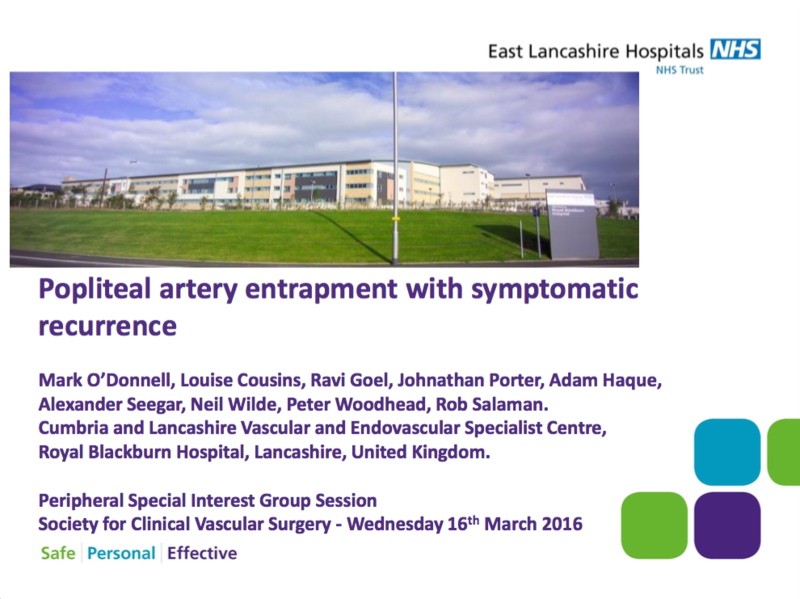 Presented “Popliteal artery entrapment with symptomatic recurrence” at the Challenging Cases Session. 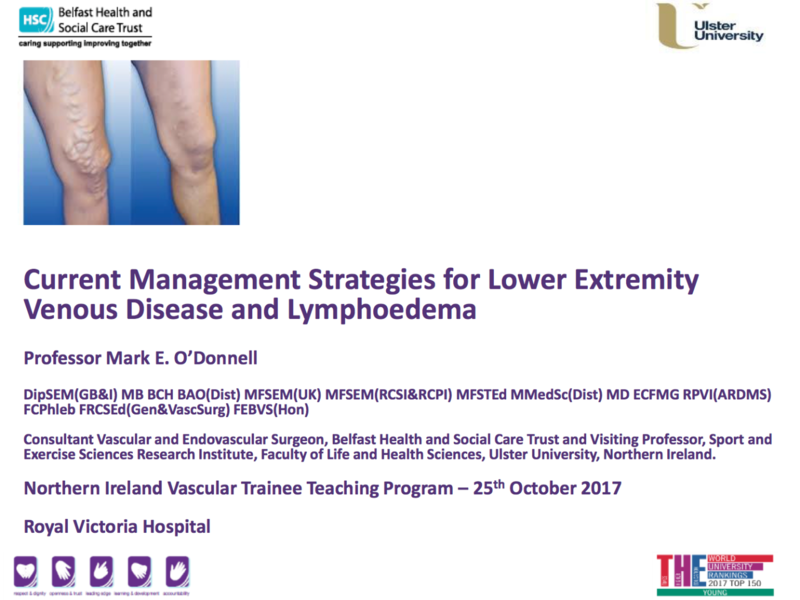 After return from my Vascular Surgery Fellowship at the Mayo Clinic, we were able to present some research conducted over the last two years. Operative Explantation of Inferior Vena Cava Filters. Mark E. O'Donnell, Cristine Velazco, Ryan Day, William M. Stone, Richard J. Fowl, Thomas C. Bower, Peter Gloviczki, Samuel R. Money. 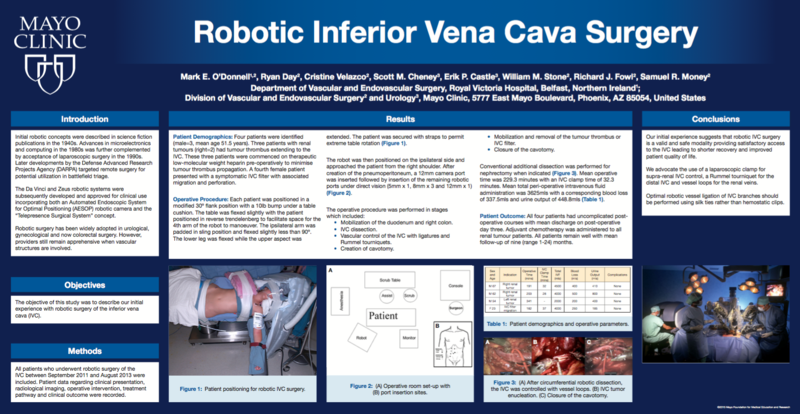 Robotic Inferior Vena Cava Surgery. Mark E. O’Donnell, Ryan Day, Cristine Velazco, Scott M. Cheney, Erik P. Castle, William M. Stone, Richard J. Fowl, Samuel R. Money. 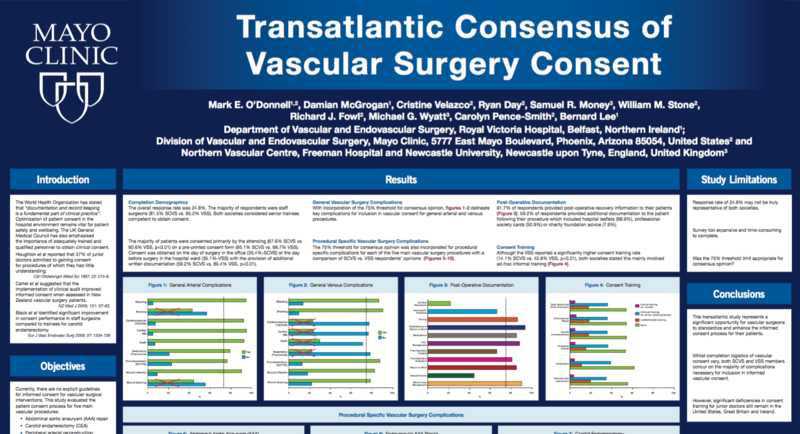 Transatlantic Consensus of Vascular Surgery Consent. Mark E. O’Donnell, Damian McGrogan, Cristine Velazco, Ryan Day, Samuel R. Money, William M. Stone, Richard J. Fowl, Michael G. Wyatt, Carolyn Pence-Smith, Bernard Lee. 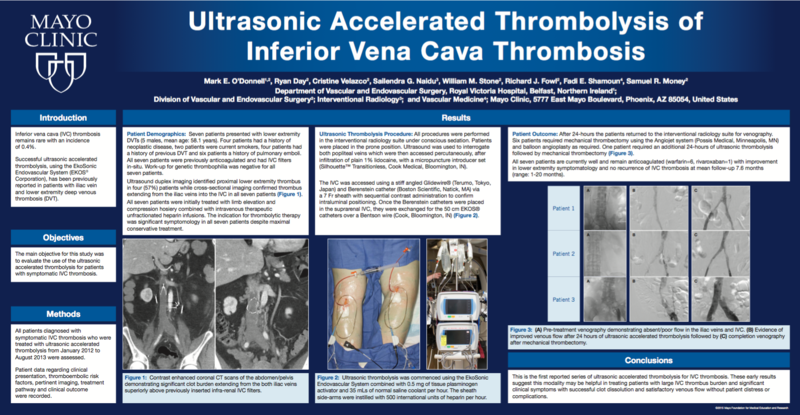 Ultrasonic Accelerated Thrombolysis of Inferior Vena Cava Thrombosis. 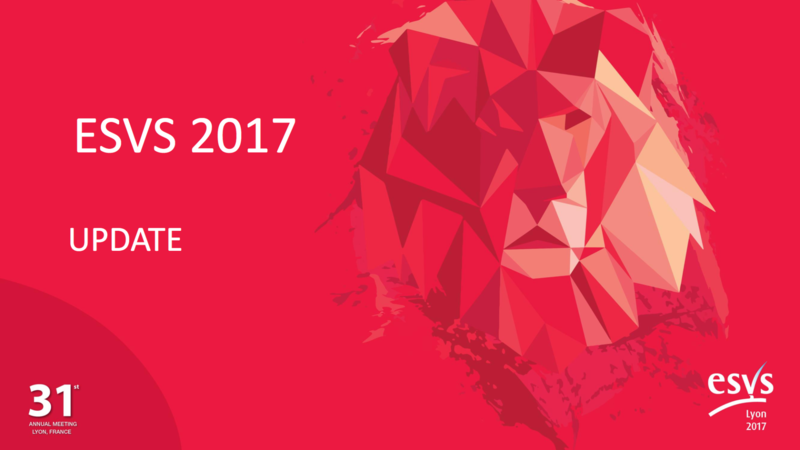 Mark E. O’Donnell, Ryan Day, Cristine Velazco, Sailendra G. Naidu, William M. Stone, Richard J. Fowl, Fadi E. Shamoun, Samuel R. Money. 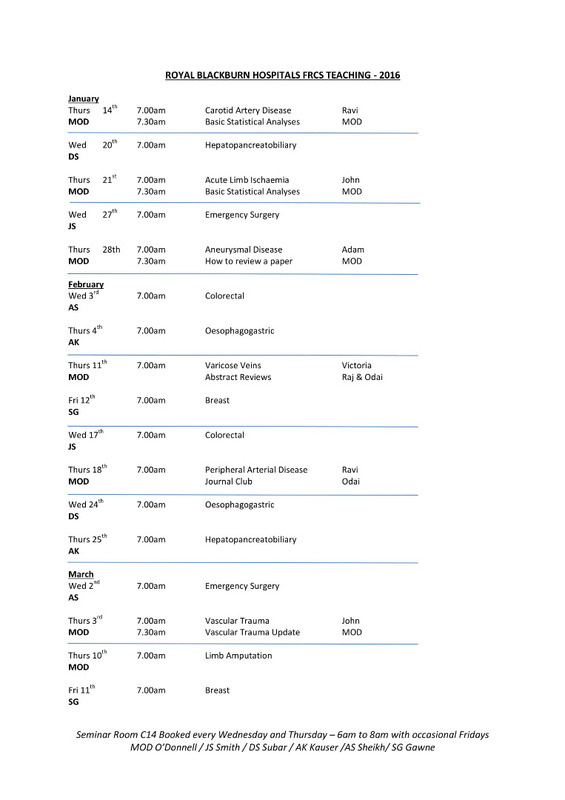 Our Surgical Directorate delivered an excellent teaching program for our senior surgical trainees one to two times per week. We were fortunate to be able to cover all aspects of the FRCS Surgical Curriculum and I wish to express my gratitude to our faculty who attended early in the morning in their own time to deliver their training sessions. The faculty included; Mr Adnan Sheikh Consultant Laparoscopic and Robotic Colorectal Surgeon; Mr Daren Subar Consultant Hepato-Pancreato-Biliary Surgeon; Ms Ambareen Kausar Consultant Hepato-Pancreato-Biliary Surgeon; Ms Jennifer Smith Consultant Colorectal Surgeon; Mr Colin Harris Consultant General Surgeon; Ms Suzanne Gawn Consultant Breast Surgeon; and Ms Trish Duncan Consultant Surgeon. A monthly session was conducted for our theatre staff before or after the audit session. An informal atmosphere was encouraged.